I knew day four was always going to be the tough one of the four days I’d planned and sitting in the comfort of my office, the day after I’ve finished, the stiffness in my legs confirms this. It’s just taken me 2 minutes to negotiate the stairs! 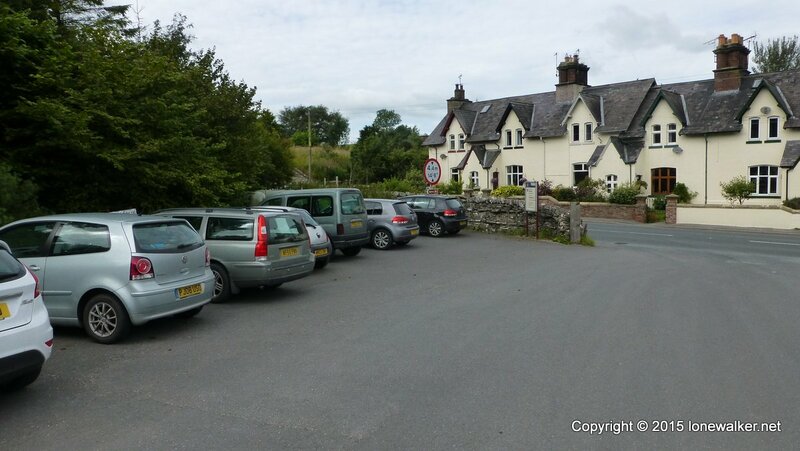 I seem to recall from my last stay at the Green Dragon that my main complaint was that the bar area isn’t particularly comfortable – it’s not really somewhere you can lounge around and relax – the chairs are old, they’re basically wooden benches with old flat cushions on them and after a while I had to move. The bar area was also pretty busy and I was beginning to feel a bit grumpy, so I decided to head back to my room and a comfortable bed. I wasn’t missing much – the beer selection was poor, no Old Peculier on tonight, and the new management team, recently taken over from the previous owner, didn’t seem particularly efficient. I did at least manage to post day three’s report while I still had WiFi in the bar, as I had no signal of any sort in my room! 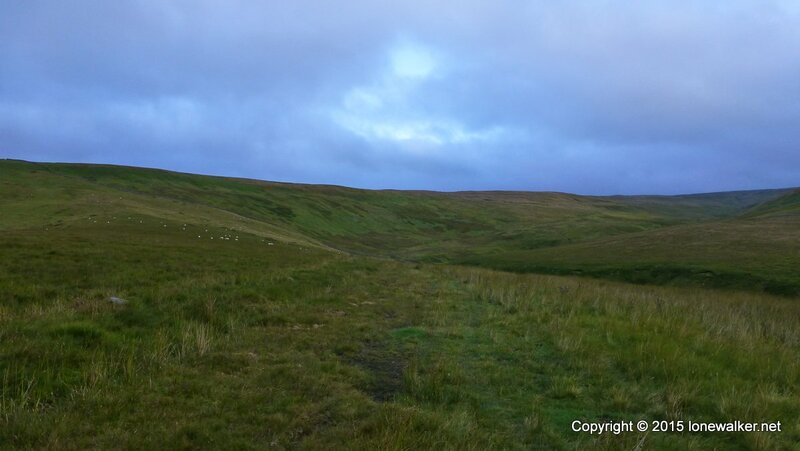 I declined the offer of breakfast, in favour of an early start in the morning – I had tea/coffee making facilities in the room and I’d bought some flapjacks in Hawes to eat before I set out. By the end of the day I was pretty much sick of flapjacks though – I wish I’d been a bit more imaginative in my shopping – I could have killed for an apple or a bag of crisps, something to relive the monotony of honeyed oat bars! I was out by 7am, into a mostly grey morning, quite chilly and with a slight wind too. 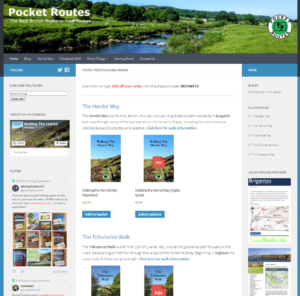 In keeping with the rest of the walk, I’d tried to make today’s route as different as possible – using paths I’d not taken before and visiting OS squares I’d not stepped inside yet. The result was a mixed bag if I’m honest. 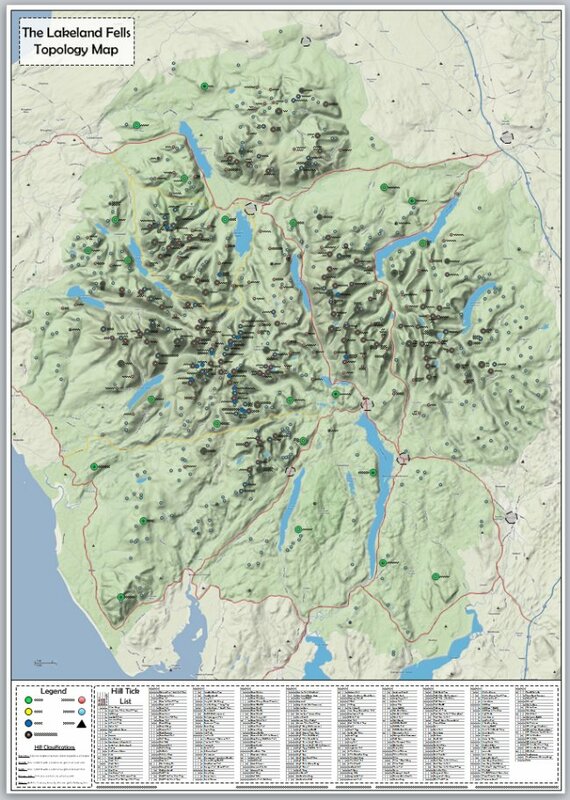 The Pennine Way path up Great Shunner Fell may not be particularly inspiring, it’s slabbed for long sections and it can be a bit of a dull plod at times, but it beats the hell out of the route I chose. 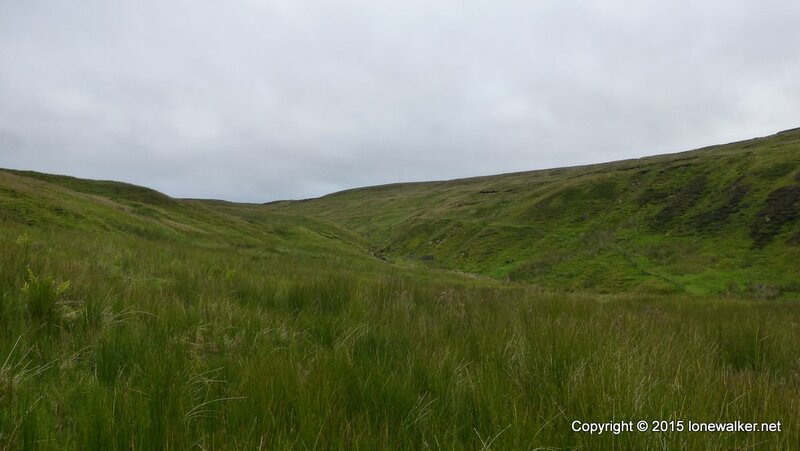 The Hearne Coal Road follows the side of the beck that runs down the bowl of the valley between Shunner on the left and Round Hill on the right. It’s a route I’ve been meaning to take for a long time – just to see what it’s like, to try something different. Today I wish I hadn’t. It’s tough going, really tough and it’s not something I needed at the start of a long day’s walking. The map shows a bridleway with a dotted black track beneath it suggesting a path on the ground. 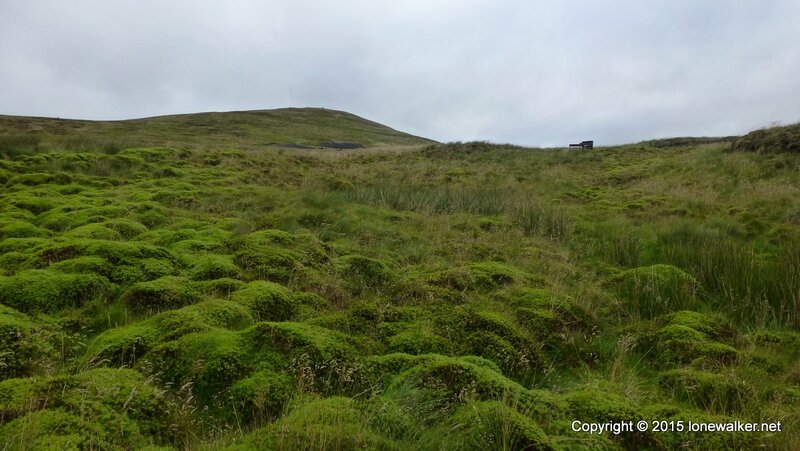 The reality is an irregular, intermittent thin path of flattened grass which could just as easily be a sheep trod and climbs up and then down, crosses huge marshy expanses, cuts through waist deep marsh grass and then takes you up a steep mossy, tussocky hillside before swinging the long way round to the summit. 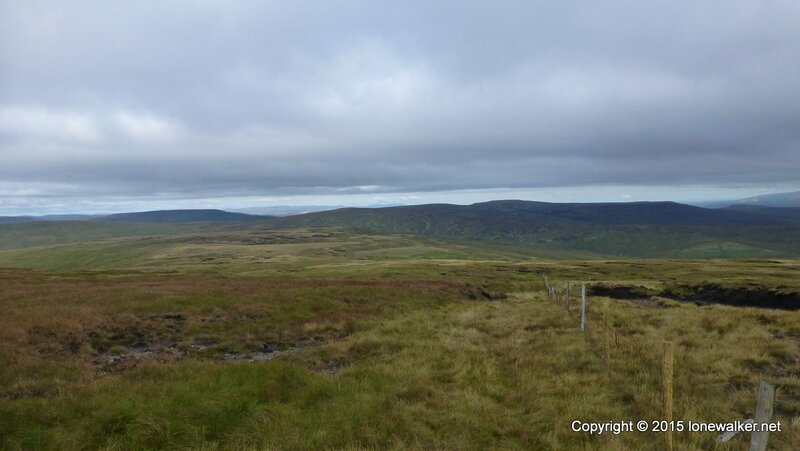 An ascent of Shunner usually takes me about 1hr 40mins – today it took me 2hr 10mins and by the time I reached the top I was completely shattered. I found this touching memorial to Ian – I wonder what happened? As I arrived at the summit shelter the mist came down, the wind chill increased significantly and I resorted to my Paramo for the first time on this trip. It went over my soft shell and along with my woolly hat and gloves I felt warm again. I had a second breakfast of flapjacks in the shelter and then stepped out into the biting wind. The mist cleared as I left the summit and I could see my route ahead, clearly now. It’s a remote path and without the fence to follow it would probably be tricky too, but typically where there’s a fence (or a wall) there’s a path and here is no different. 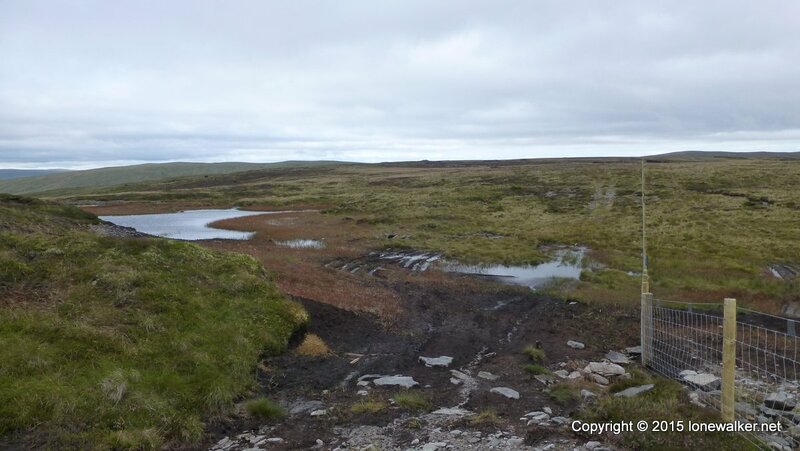 As you would expect it’s wet and soggy in places, very boggy in others but surprisingly firm for much of the crossing. 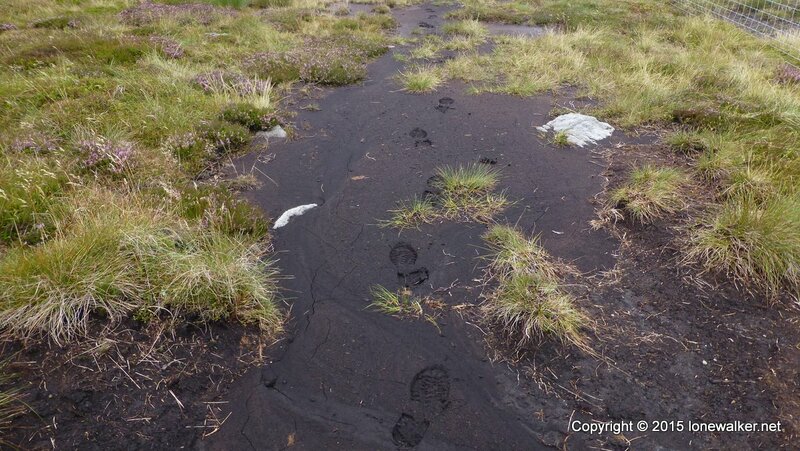 For a good distance I followed a clear set of footprints – small boots and a much smaller stride length than my own, so I assumed a small guy had passed here the day before. 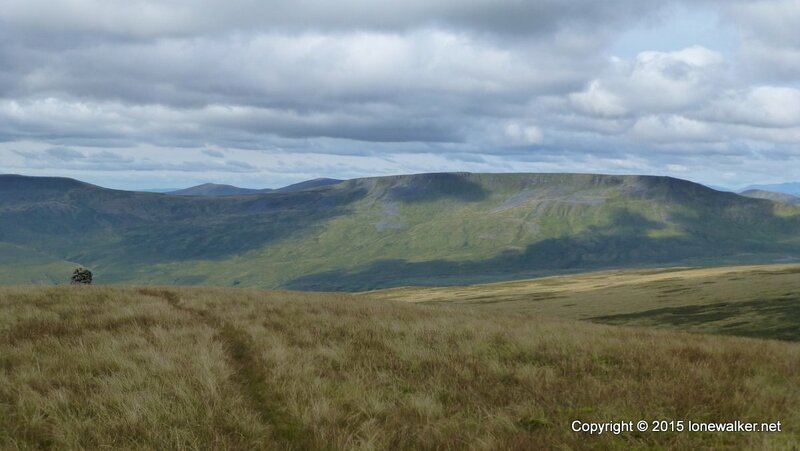 It was reassuring, as footprints often are on a remote fell, but at Knoutberry Currack I lost them, so I presume he headed off down into Cotterdale, while I pressed on alone towards Hugh Seat. 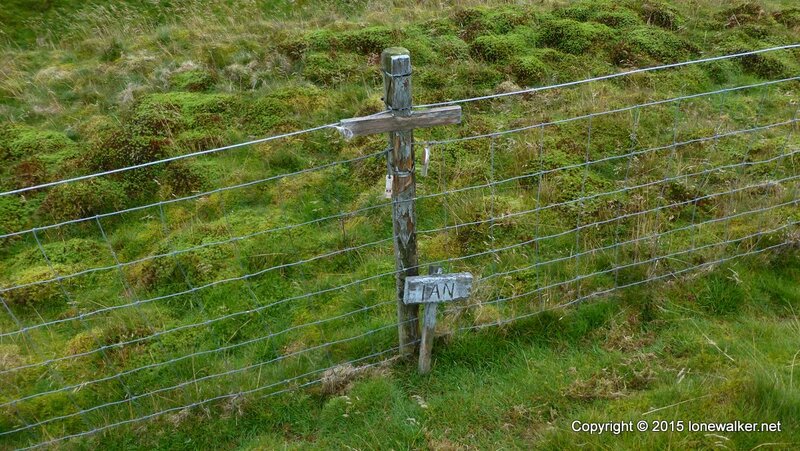 The fence is punctuated with simple stiles every couple of miles and these became my benches. With very few rocks to perch on I looked forward to seeing a stile, so I could rest for a few moments, catch my breath and perhaps swallow another chunk of flapjack. 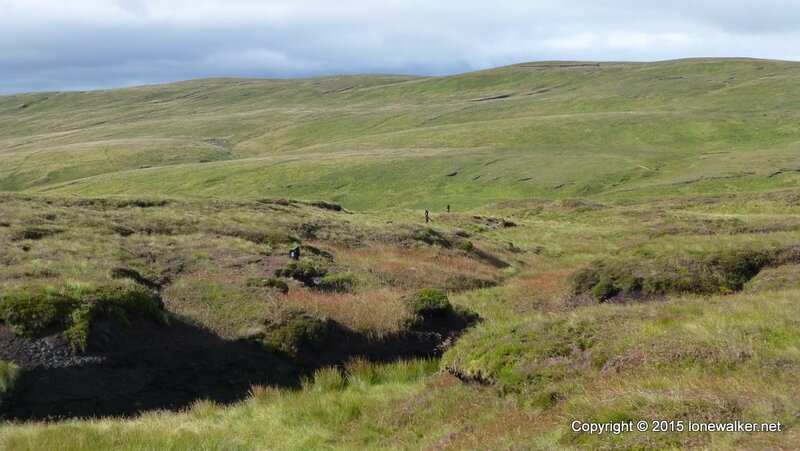 The climb up to the Mallerstang ridge was both welcomed, as it meant I was leaving the boggy common behind and dreaded as it meant a long slow climb up. 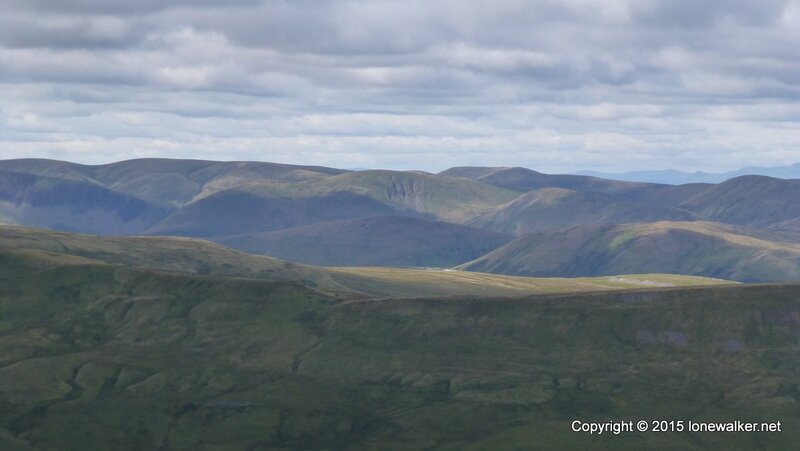 I eventually reached Hugh Seat and Lady’s Pillar and perhaps my favourite view anywhere in the Dales – the one across Eden Valley to Wild Boar Fell. I stopped and rested on the wooden gate for a moment or two, soaking in the view and then turned into the wind and along the ridge. The views in general along the ridge, not just the one from Hugh Seat, are incredible. 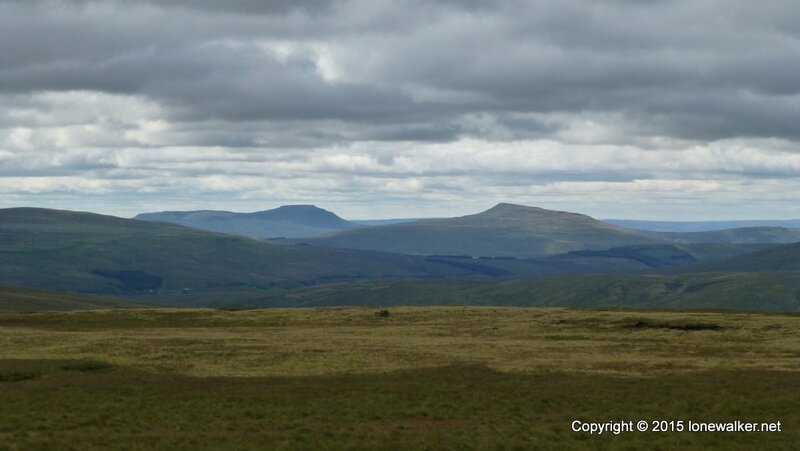 All the Yorkshire Three Peaks, the Howgills, Cross Fell, the Lake District Fells can all be seen from here and the air clarity today was fantastic. 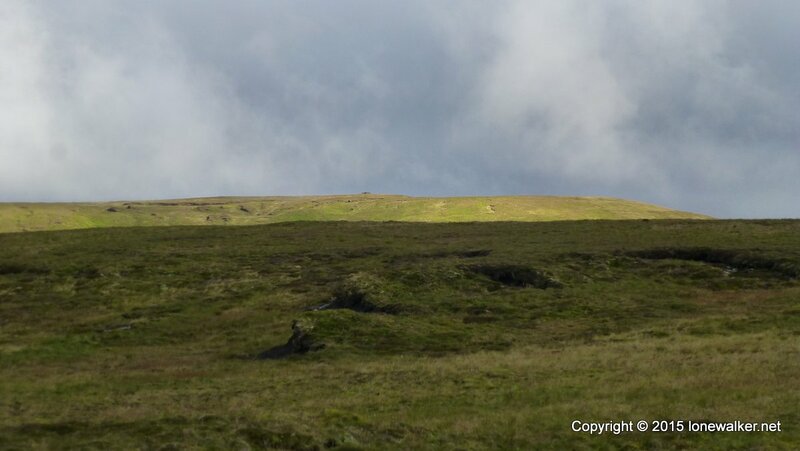 The sun shone intermittently and the shadow play across the fells was fantastic. I kept losing the path for watching the surrounding Fells, but at least today I managed to stay on my feet and not fall on my arse. 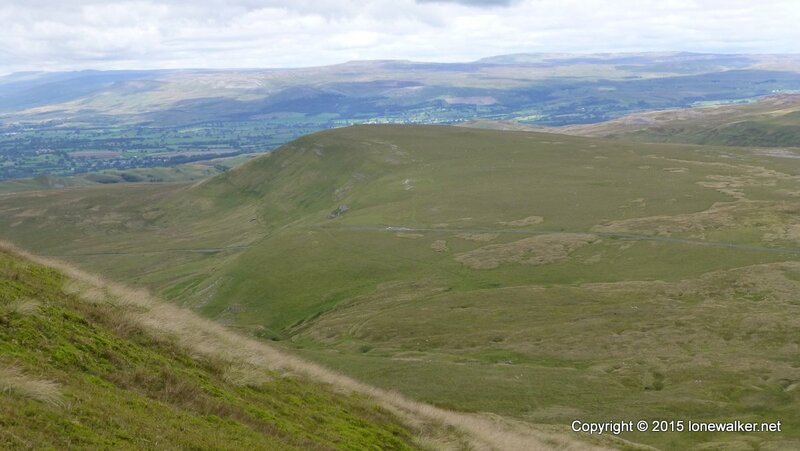 The climb up to High Seat was draining and it seemed to take the last of my energy. 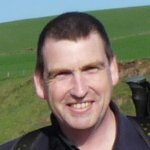 My bruised left foot had been sore since leaving Hardraw – it was now joined by righty, who had been wet for so long he was developing a blister. 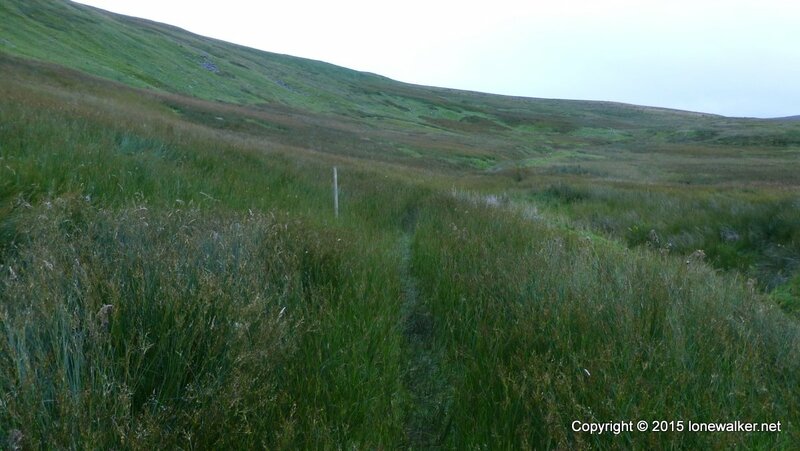 I’d stopped diverting to OS squares, lack of energy and poor will power meant I’d have to walk this path again at some point, but that was a problem for another day – I just wanted to get to the end of the day and put my feet up! 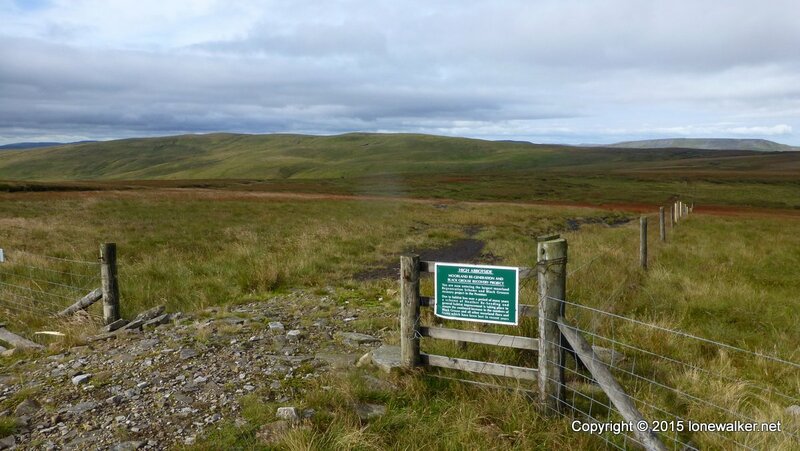 From High Pike, at the end of the ridge, I dropped steeply down to the tarmac road and that too also dropped steeply in places towards the little village of Nateby. I would gladly have accepted a lift from a passing car along here, but thankfully no-one offered and I managed to resist putting my thumb out. I decided against the climb up Tailbridge Hill, the descent of which looked almost vertical and I was pretty sure my knees and feet wouldn’t have managed it! 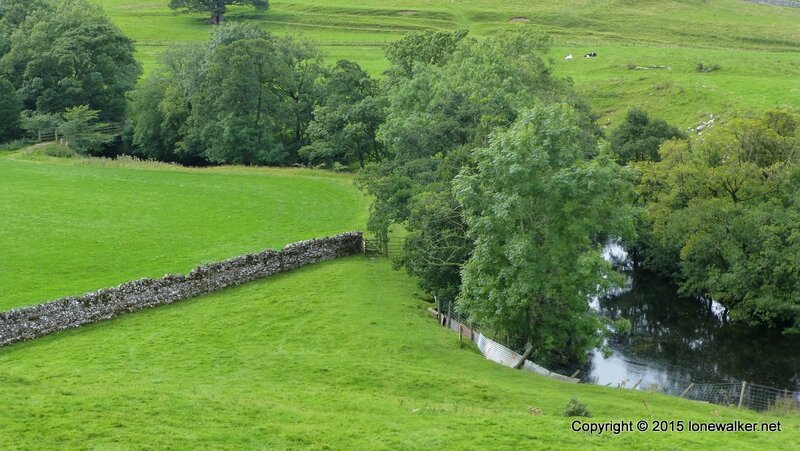 I slogged the final mile or so through Nateby, down into the valley beyond, across the River Eden on a wide footbridge and then steeply up through meadows to Kirkby Stephen station. I don’t think I’ve ever been so pleased to see my car, comfort, security and the quickest route to a shower! I was just about done in. My tweet just about says it all I think.